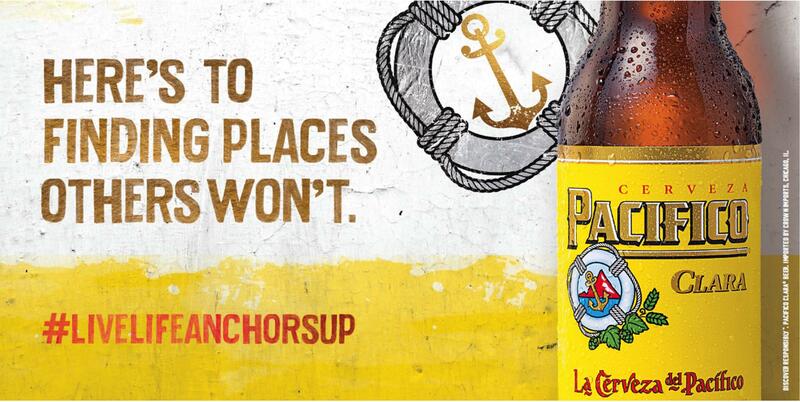 Pacifico: Live Life Anchors Up. The concept behind this campaign is that Pacifico is for those people who truly Live Life Anchors Up. These are the people who follow their own compass and carve their own paths. And when you carve your own path you end up in places where not a lot of people go. So Pacifico put some OOH messaging in those out of the way places and the messaging isn’t targeted to the masses, it’s out targeting our people. OOH billboards were strategically placed in Newport, VA, Copper Harbor, MI, Crescent City, CA and Adirondack Park, NY. Outdoor advertisement created by Cramer-Krasselt, United States for Pacifico, within the category: Alcoholic Drinks.